Elburn Cooperative (CHS Elburn) is an agricultural company based in Sycamore, Illinois with over 15 locations across northern Illinois and southern Wisconsin. Their dedicated staff provides unparalleled service in grain merchandising, agronomy, petroleum, feed, trucking, and logistics. We have worked with Elburn Cooperative for over 12 years on every aspect of their marketing communications, and in that time we’ve developed a strong brand that resonates well with growers. Like most forward-thinking brands, their marketing communications have moved heavily towards digital in recent years. Several years ago we designed, developed, and launched Elburn Cooperative’s website, www.elburncoop.com. Since that time, analytics have revealed 55% of website visitors come from mobile devices. Topping the chart is Apple iPhone, which represents 67% of the total number of visitors from mobile devices. Our research also showed the top most visited website pages on mobile devices were Grain Closing Bids and Elevator Cash Bids. The popularity of these pages was not surprising: farmers regularly track the grain markets on a daily basis. Commodity prices set the tone for budgeting a grower’s operation, including land cash rents, employment, and the purchase of farm equipment. 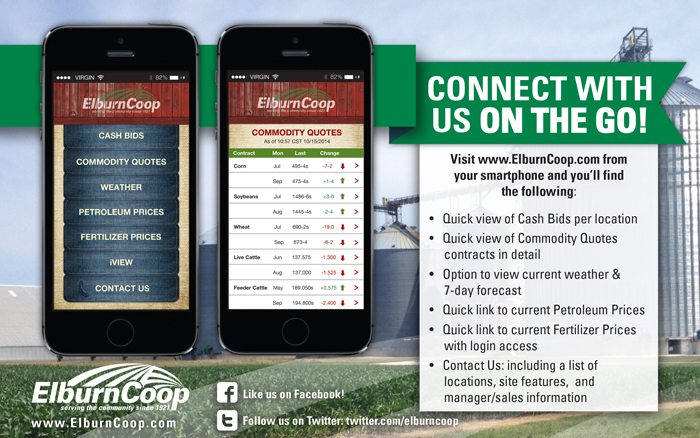 With all this information in hand, we set out to improve the visitor mobile experience by creating a mobile-friendly website for Elburn Cooperative. Our objective was simple: develop a condensed version of the full, data-heavy website. From our research, we also discovered the need for quick tabs to weather, petroleum prices, fertilizer prices, mapping locations, and contacting staff. 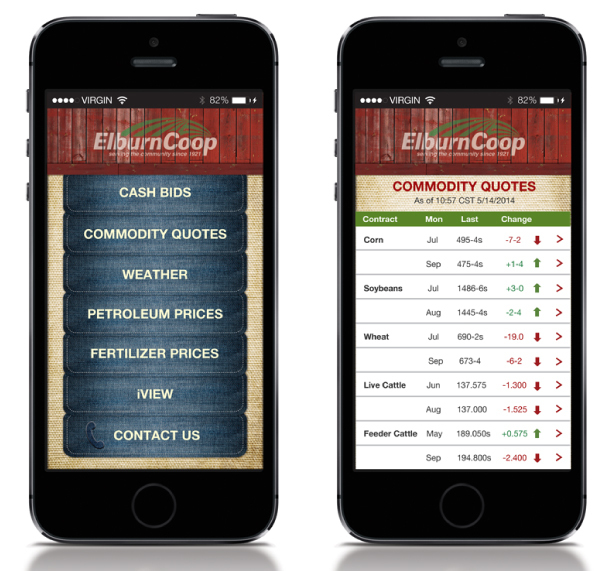 Utilizing the Google Analytics research, we converted Elburn Cooperative’s most popular mobile pages into easy-to-navigate pages with simple, readable tabs for mobile devices. This mobile-friendly website is customized to fit a mobile screen, making it much easier to access www.ElburnCoop.com on a mobile device rather than viewing the full website. We also worked with a third-party provider of market data to automatically update the weather, Grain Closing Bid and Elevator Cash Bid pages. Is your website mobile-friendly? Contact us today to see how we can help you reach your target market wherever they are – right on their smartphone or tablet.